From the time she was a little girl Mary felt a yearning to express herself through paint and color. During her years of working as a human service professional, she took up art at various times only to lay it down again, judging it as beyond her ability. When she turned 60 she gave herself an ultimatum to either fully commit to herself as an artist, or donate her art supplies. In the summer of 2008 Mary started watercolor classes with Pat Morgan at the Wallkill River School of Art in Montgomery, NY, a welcoming and supportive local art community. Despite the challenges and risks inherent in watercolor, its near magical, light-filled possibilities awakened her passion and a new-found capacity for perseverance. 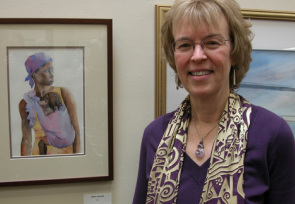 Mary’s intense nature and deep spirituality imbue her watercolors with great depth of feeling. Her luminous style of painting has a sensitivity that is at once both delicate and compelling. 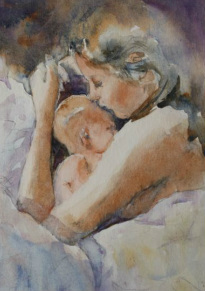 The focus of her work has been predominately on expressing the deep emotional connection that she feels with her subject whether it’s a mother and child or a moment alone in the forest.